Please watch the VIDEO of her describing her experience with PARCC preparation. She speaks for herself quite eloquently, if I do say so myself! 10 Year Old Takes Down PARCC (in case the embedded video doesn’t work, here’s a link to a YouTube version). 1. I want to thank our local micronews blog, Baristanet, for promptly covering last night’s meeting, with its article comprehensively describing the Board meeting live on its site by this morning. I’m glad that there was real — and relatively real-time — press coverage of last night’s meeting. We can’t be an informed community without reliable journalists to report the news. The Montclair Times and The Alternative Press -Montclair have now filed stories as well. I am really hopeful that given this prompt response last month’s lack of full coverage was an aberration. Thank you to our local press — your job is critical. 2. This morning Elizabeth’s story appeared on Valerie Strauss’s Washington Post education blog, The Answer Sheet. I want to give Valerie the credit she deserves for this piece. In early November, we took a family trip to Washington, D.C. As some regular readers of this blog know, Valerie, who is a super-hero in the movement to push back against the current so-called “education reform” movement, published my second blog post ever — and a bunch of my blog posts since that time — on The Answer Sheet. Coincidentally, it turned out that The Washington Post was on the route from our DC hotel to our nearest Metro stop. I sent Valerie an email saying that it was a thrill to see the HQ of the newspaper that had published some of my work, and she graciously offered to give us a tour of the newsroom. She came in on a Sunday and met us to give us our tour (my youngest adores her because she suckered Valerie into letting her abscond with a pink flamingo ornament from Valerie’s desk) and, as you can imagine, we talked education, teaching, policy, and politics. Elizabeth was an active participant in that conversation. I think Valerie was blown away when, after she’d told a story about using her role as a journalist to expose an inequitable situation faced by a boy with a physical disability in the DC schools, Elizabeth asked, “Do you think that the DC or the Philadelphia schools are worse these days?” So Valerie encouraged Elizabeth to write about PARCC and PARCC test prep from a student’s perspective. On our way home, Elizabeth was composing the first paragraph of what eventually became last night’s public comment to the Board. She’s been working on it on and off ever since. But when we learned this weekend that the Board had placed the PARCC parental refusal on its agenda, Elizabeth buckled down and finished the last bits of her piece. My involvement was to add the explanatory note that appears in the WaPo piece, to fix about 3 typos, and to give Elizabeth a brief mini-lesson on embedded quotation marks. After she finished, she read it aloud a few times, and we timed her and discussed some tips for public speaking. I honestly wasn’t sure whether she would actually speak or not until she went up there. And I couldn’t be prouder of my kid! I think that last night demonstrated, far more comprehensively and concretely than any standardized test possible could, that Elizabeth is on track for college, career, and, most importantly, active and thoughtful participation in civic life. I cannot begin to thank her teachers enough for their role in helping her to grow into the amazing little girl she is and continues to become. I don’t need a standardized test to tell me that they’re doing wonderful work — but I can and will continue to do what’s within my power to ensure that they can do their work as unfettered as possible by mandates from those, such as Arne Duncan, David Hespe, and Penny MacCormack, with little or no classroom teaching experience. Good Morning and Happy Thanksgiving! At the moment, in addition to all of the usual things I’m thankful for (family, including a house full of people and a huge 51 person family Thanksgiving feast this afternoon; snow; friends; and the good fortunes of good health, a decent job, and the good fortune to be able to live a pretty decent life), I’m thankful for my fellow citizens here in town who are speaking up against the takeover of our schools by high-stakes standardized testing (specifically, PARCC). There were three letters to the editor in yesterday’s local paper, The Montclair Times, questioning or opposing PARCC in our schools, including mine, which I have reposted below. The momentum is building locally to just say no to these high-stakes tests. Especially in a town like Montclair, where our school board is appointed, not elected, the Opt-Out movement (and mass opt-out at the local level) is how we parents can, at a grassroots, local level, vote to say no to the test-focused realignment of our public schools. Happy Thanksgiving, Acting Commissioner David Hespe. The name says it all: the new Partnership for Assessment of College and Career Readiness (“PARCC”) standardized test our district must offer to our 3rd-11th graders this spring reflects what its developers believe is the purpose of public school: to prepare children for college and careers. They are wrong. The purpose of public education is — and should be — far more lofty: to educate inquisitive, analytical, and thoughtful citizens prepared to cast educated votes and participate in thoughtful analysis and debate should they be chosen as jurors. Readiness for college and careers is a by-product of that goal, but the goal is preparation for effective citizenship, not vocational training for employment. I’ve been a Montclair schools parent for five years now, and while I applaud many of our public schools’ offerings, my older daughter’s school experience has been shockingly bereft of social studies education. Discussions with teachers and administrators reveal the reason: where the PARCC reigns supreme, the curriculum narrows. There is no time for social studies beyond map skills, an occasional out-of-context project, and the ubiquitous pre-digested and uncontroversial Scholastic News. What happened to classic elementary school fodder such as current events, studies of world cultures, inquiries into genealogy and family history, research into Native American cultures, immersive units studying Ancient Greece, Rome, Egypt, China, or Mesopotamia, and even the most basic American history? The often-whispered answer is that these units were casualties of the PARCC assessment: PARCC doesn’t test social studies, so our schools don’t teach it. Montclair is one of the rare New Jersey suburbs with a rich history of refusing to standardize itself. Say no to off-the-shelf standardized education. Start demanding citizenship-focused public schools by refusing the PARCC. Almost eight years ago, my family was trying to figure out where — in New Jersey — to buy a house and put down roots. I’m a Jersey girl, born and bred. I grew up in Short Hills, and attended the Millburn Public Schools for 13 years. As my local readers know, the Millburn Public Schools are consistently considered some of the highest performing schools in the state. However, in March of my senior year of high school, our family moved to Montclair. I commuted back to Millburn for the last few months until I graduated, but the following fall my brother began his sophomore year as a student at Montclair High School. At the end of that year, my family moved back to Short Hills, so that my brother graduated from Millburn High School. Almost eight years after that conversation, I now have two children enrolled in the Montclair Public Schools. Almost universally, I have been thrilled with my daughters’ teachers, who have been thoughtful, dedicated, experienced professionals. But things are changing. Our test-taking focused national, state, and now local culture threaten the values that make Montclair unique: by insisting that all children must learn all things in lockstep, we deviate from education best practices. And by accepting — without question — a test-taking culture that imposes hours and hours of standardized testing on our 8, 9, and 10 year old children, without carefully reviewing these tests and pushing back as a community where we believe the tests are poorly designed, developmentally inappropriate, and leading to intense pressure to narrow curriculum to meet the tests’ demands, we are stepping away from the community values that make Montclair special. Our schools should be — and historically, through our all-magnet public school system, have been — tailored to meet our children’s needs, but now we seem to be under pressure to tailor our children to meet state and federal politicians’ and bureaucrats’ unrealistic expectations — and if we don’t, our schools will be declared failures. So what can we — as parents — do? Identify a theme in “Just Like Home” and a theme in “Life Doesn’t Frighten Me.” Write an essay that explains how the theme of the story is shown through the characters and how the theme of the poem is shown through the speaker. Include specific details from the story and the poem to support your essay. Second, if, after reviewing the tests yourself, you find that you have concerns about these tests, think seriously about refusing these tests on behalf of your children. There are all sorts of Facebook groups for parents who are thinking of opting-out (for e.g., there’s one called Opt Out of Standardized Tests – New Jersey). Talk with your children about this. You will start to hear that your kids will not be alone if they refuse these tests. There is strength — and power — in numbers. And I’ve found that the front-line educators in our schools will at least quietly applaud your efforts. The school culture may be such that they are not comfortable speaking up publicly, but they know right from wrong when it comes to educational practice. Mention that you’re thinking of joining the opt-out movement, and you will see eyes light up. Third, speak up. Attend Board of Education meetings to make your voice heard. Talk with other parents. Write letters to the editor and op-eds. Call and write to your legislators. Contact the Board of Education — at both the state and local levels. Demand that our local Board of Education immediately issue its position regarding the opt-out/refusal movement, and demand that they make alternate learning opportunities available to our kids. Fourth, suggestion alternates to a testing-focused culture. We can evaluate our kids’ learning in different — but more effective — ways. For instance, we can demand that our district evaluate kids’ progress toward achieving standards by asking schools to work with students and parents to compile portfolios of student work or require students to complete capstone-type projects at critical junctures. I taught high school in rural Maine at the turn of the millennium and we were able to make the portfolio and senior project approach work there. There is no reason we can’t manage the same here in Montclair. Standards-based assessment does not require standardized testing. 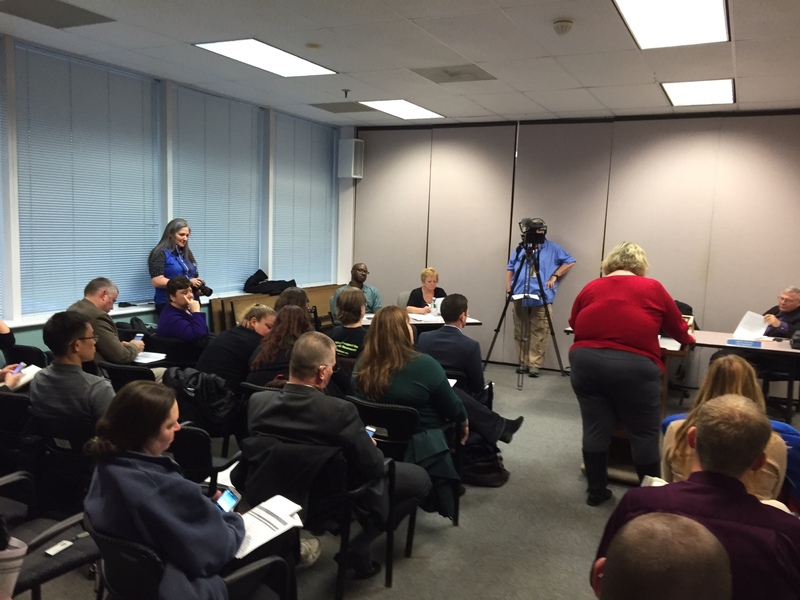 Fifth, demand detailed local coverage of Board of Education meetings. 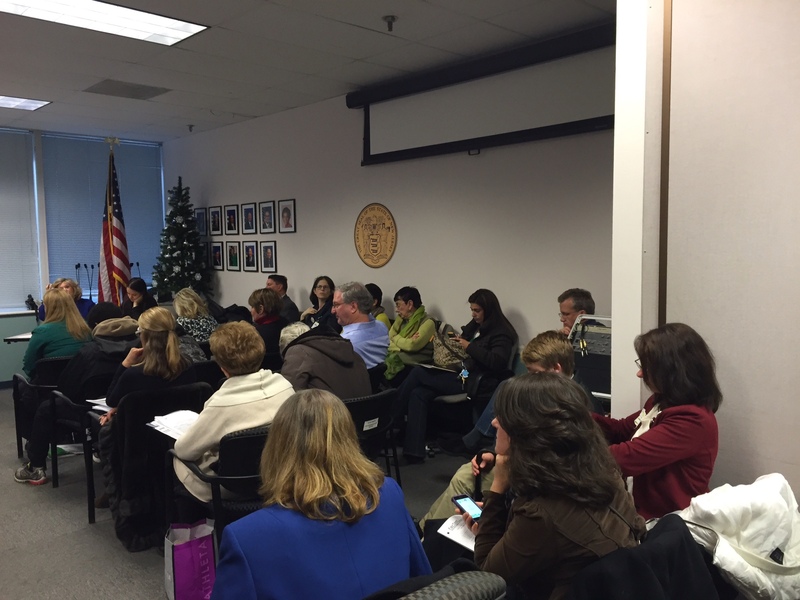 Many people (including me, but I was far from alone) spoke at the BOE meeting on Monday, November 17, 2014, but it is now more than a week later and the only coverage I saw in our local media (print and online) was a small Montclair Times article regarding a tiny subset of what was discussed (it discussed only the process by which the BOE can respond to questions posed at meetings). But The Montclair Times failed to do a comprehensive article regarding the meeting, and Baristanet, Patch, and The Alternative Press were completely silent. 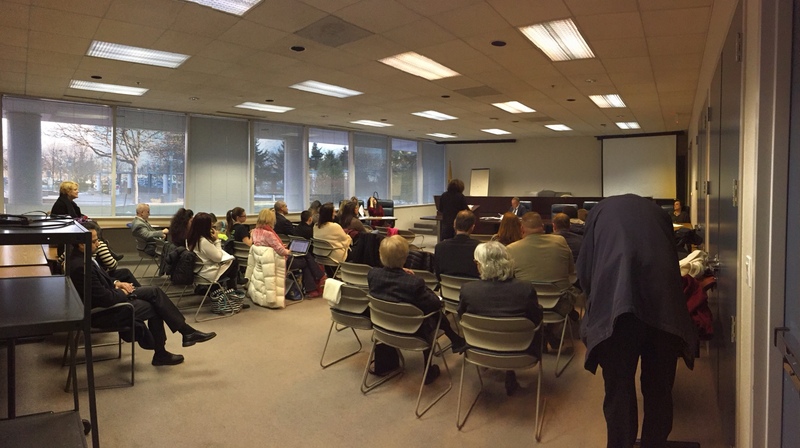 [UPDATE: At 7:42 on Tuesday, November 25, 8 days after the meeting was held, Baristanet ran this story, which does attempt to summarize the public comment portion of the meeting, but still does not summarize the three reports to the BOE, nor the illuminating BOE discussion after public comment ended.] We don’t know what’s happening unless we have journalists covering these issues. And yes, Montclair Cares About Schools did a terrific email summarizing the last BOE meeting, but as much as I tend to agree with them on many issues, I recognize that this is an email from citizens summarizing their point of view, and that while I think it was a quite accurate summary, I’m not sure this was always true of all of their characterizations of BOE materials in the past, and more generally speaking, the MCAS email doesn’t have the same authority as an unbiased news source that our local news outlets at least theoretically have. I can’t find a link to the email on their blog, but the Montclair Cares About Schools blog, Montclair Voices, does contain a bunch of the public comments made at last week’s meeting. 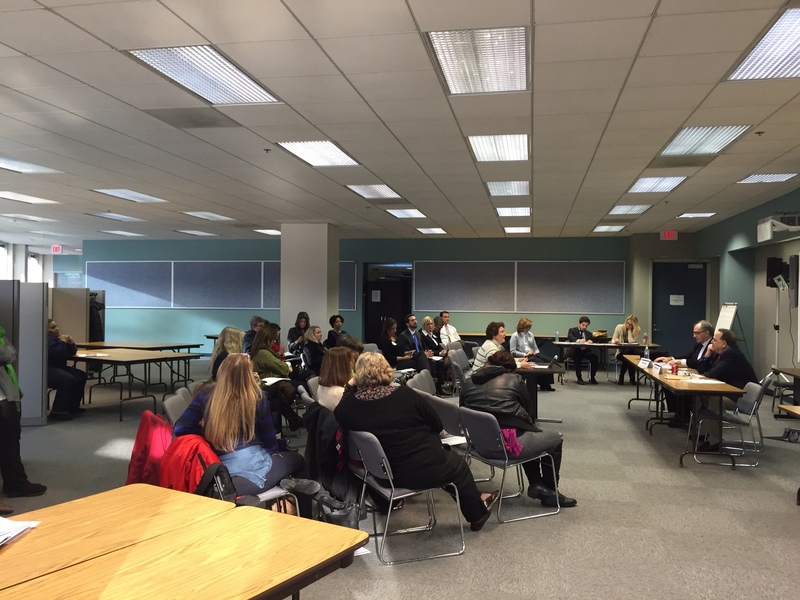 Similarly, our Montclair teachers’ points of view (and a bunch of their public comments to the BOE last week) are reflected on our teachers’ new blog, Montclair Education Matters. High quality — and diverse — schools are what brought many of us to Montclair, and they are what keep us here. We need to unite as a community to reject externally-imposed policies (whether imposed by NJDOE or the USDOE) that stand between our children and the well-rounded educations our children deserve — and that our teachers know best how to provide. And that includes educating and supporting our local school board members so that they have the knowledge, community support, and tools to stand with us at the front lines of saying no to so-called “education reform” that is bad for our children, bad for our schools, and bad for our community. If someone knows how to grab my snippet and put it on YouTube, I’ll link it that way instead. Here is the text of my prepared remarks for tonight’s local Board of Education meeting. I think I deviated a litte bit — but not very much — from what’s written here. If I can figure out how to get a snippet of the video, I will add that to this post (embarrassing as that might be). Please note that my comments were limited to 3 minutes. I am here today to ask the District to formally state — in writing to all parents — its policy regarding how children who are refusing the PARCC exams will be accommodated. 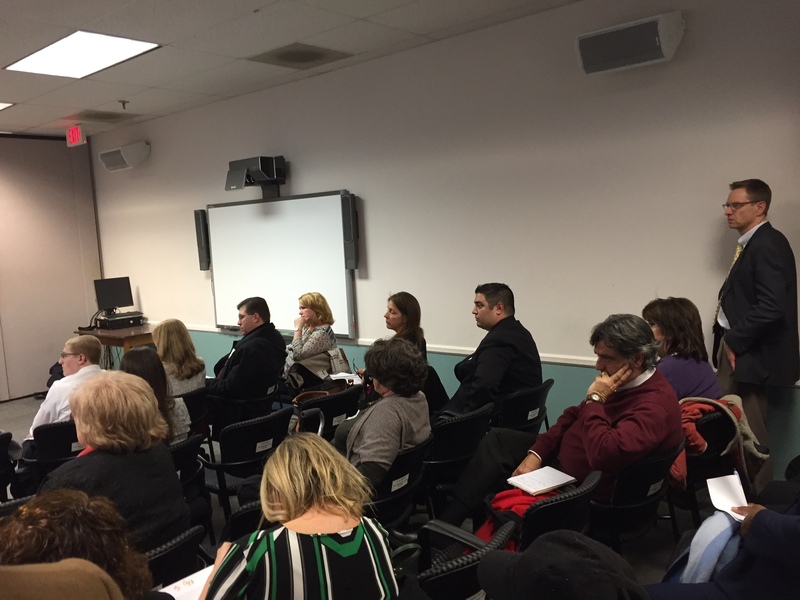 I attended the District’s October 23rd PARCC Family Presentation, where Gail Clarke was asked to comment regarding the district’s opt-out or refusal policy for the PARCC exams. She stated that no policy was in place because the State DOE had not yet issued its guidance regarding opt-out decisions. A week later, on October 30th, the New Jersey Department of Education issued “guidance” to school districts stating that districts were under no obligation to provide educational alternatives, and suggested — but did not require — that districts update their attendance and discipline policies to address PARCC opt-out issues. 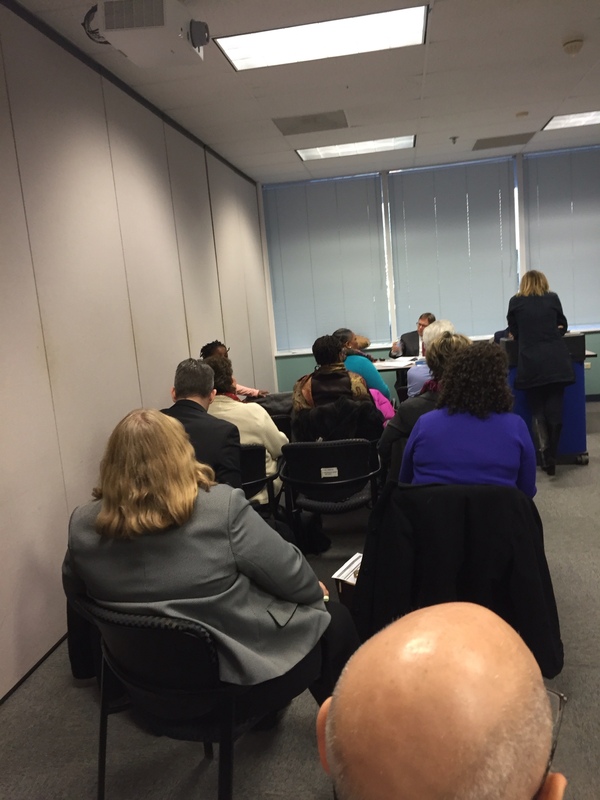 NJDOE’s guidance is at odds with Montclair’s prior policy. So, given the conflict between Montclair’s NJASK opt-out policy and the State’s recent guidance, I am here to ask what Montclair’s policy will be for handling PARCC refusals. And, as a parent, I am here to urge you to adopt an accommodating and humane policy. I’ve reviewed the 3rd and 4th practice exams and sample questions on the PARCC website. I found many questions confusing and developmentally inappropriate — frankly, the “gotcha” feel of these questions reminded me of the New Jersey Bar Exam. I am also concerned that we are asking students as young as 8 to compose essay responses on computers when the district hasn’t provided comprehensive typing instruction. I try to avoid making decisions without access to all of the facts, which is why I’ve reviewed the PARCC sample materials in depth. So before I make a final decision regarding the PARCC exams, I would like to review the District’s PARCC opt-out policy. This is an urgent matter, given that my daughter reports that her class has already lost at least 6 periods of instructional time to PARCC preparation, including last week when her class was asked to attempt an End of Year math practice test before the children had been presented with many of the topics tested.